Wendy Krueger has spent eight years as a speaker bureau agent, managing speakers ranging from $5k to $100k+. This experience taught her what makes a speaker successful. Aside from speaking skills, it is how you market, brand, and position yourself in the marketplace. Wendy noticed a niche in the market when she would be out at an event and people would often ask her what she did. She found that she always seemed to be standing next to an aspiring speaker. She launched Speaker Map Coaching to help new and emerging speakers grow their business. Wendy joined Mario on 10 Minute Mindset to talk about the public speaking industry, how to get started as a speaker, how to get paid as a speaker, and how public speaking can lead to a multitude of breakthroughs in both business and life. Connect with Wendy online at Clarity.fm/WendyKrueger and follow her on LinkedIn. Hassan and Ali Zreik are back on 10 Minute Mindset to talk about what it was like growing up together and then starting a business together as brothers, what they have learned through their close relationship and entrepreneurial journey, and how they successfully integrate their personal, professional, and business lives. Hassan is the Co-founder and CEO of Visrex. He is an MD/MBA candidate at Michigan State University College of Human Medicine and Eli Broad college of Business. He earned a Bachelor of Science from the University of Michigan. He is a business executive with valuable experience in innovation and strategy with a focus in healthcare. His research is widely published in several prominent medical journals. Hassan is a community advocate and sits on the executive board of a few community non-profit organizations. Entrepreneur and pioneer in pharmaceutical innovation Ali Zreik is the Co-Founder and CEO of Visrex, an innovative marketplace where pharmacies can shop, compare and save. Ali is a leading entrepreneur, strategist, and innovator with a proven track record of success in executive growth and business operations in the healthcare industry. His healthcare experience and innovative thinking fueled the founding of Visrex, which became a success story in the pharmaceutical industry. Ali is currently completing his Masters in Business Administration. Connect with Hassan and Ali online at Visrex.com. Hassan Zreik is the Co-founder and CEO of Visrex. He is an MD/MBA candidate at Michigan State University College of Human Medicine and Eli Broad college of Business. He earned a Bachelor of Science from the University of Michigan. He is a business executive with valuable experience in innovation and strategy with a focus in healthcare. His research is widely published in several prominent medical journals. Hassan is a community advocate and sits on the executive board of a few community non-profit organizations. Entrepreneur and pioneer in pharmaceutical innovation Ali Zreik is the Co-Founder and CEO of Visrex, an innovative marketplace where pharmacies can shop, compare and save. Ali is a leading entrepreneur, strategist, and innovator with a proven track record of success in executive growth and business operations in the healthcare industry. His healthcare experience and innovative thinking fueled the founding of Visrex, which became a success story in the pharmaceutical industry. Ali is currently completing his Masters in Business Administration. Hassan and Ali joined Mario on 10 Minute Mindset to talk about their company Visrex, how it is disrupting the pharmaceutical field, what keeps them going as disruptive entrepreneurs, and how they keep their mindset shard with such aggressive goals and aspirations. Connect with Hassan and Ali online at Visrex.com. Patricia Costanza is back on 10 Minute Mindset to talk about how we can communicate more effectively to create happiness in our lives, how humans have been on the quest for happiness as far back as we can remember, and what we can learn from the happiest man in the world according to science. Patricia is a project and communication specialist with over a decade of industry experience. She is the founder of the thecolourofhappiness.com where she shares information and promotes living a positive lifestyle for those searching for more happiness in both their personal and professional life. Connect with Patricia online at TheColourOfHappiness.com and follow her on Instagram, LinkedIn, and YouTube. Patricia Costanza is a project and communication specialist with over a decade of industry experience. She is the founder of the thecolourofhappiness.com where she shares information and promotes living a positive lifestyle for those searching for more happiness in both their personal and professional life. Patricia joined Mario on 10 Minute Mindset to talk about the power of happiness in our lives, how she discovered happiness in her life, how she continuously fosters her own happiness, and learning to trust ourselves and forgive others grows happiness in our own lives. Connect with Patricia online at TheColourOfHappiness.com and follow her on Instagram, LinkedIn, and YouTube. Sam Eid is back on 10 Minute Mindset to talk about the power of the present moment, how both time and control are illusions, how to maximize our talents and experience in the present moment, and to use all of this to overcome fears that hold us back. Sam is a 22 year ex-advertising agency producer turned life and talent coach for his brand called PowerBrand. He is a certified practitioner of NLP, Hypnosis, Access Consciousness, Timeline Paradigm Technique, Eriksonian language and Mindscaping. During his time in advertising, Sam has interviewed and recruited top talents from across the globe, filming in over 42 countries and garnering awards from festivals like The Cannes Film & advertising festival, New York Festivals, The Loeries and Dubai Lynx to name a few. And very recently nominated as top 5 Head of Production producers in the 2018 B&W Report. Sam has taken his experience and insights to helping people identify their talents and unleash their true potential. Connect with Sam online at PBCoach.me and follow him on LinkedIn and Instagram. Sam Eid is a 22 year ex-advertising agency producer turned life and talent coach for his brand called PowerBrand. Sam is a certified practitioner of NLP, Hypnosis, Access Consciousness, Timeline Paradigm Technique, Eriksonian language and Mindscaping. During his time in advertising, Sam has interviewed and recruited top talents from across the globe, filming in over 42 countries and garnering awards from festivals like The Cannes Film & advertising festival, New York Festivals, The Loeries and Dubai Lynx to name a few. And very recently nominated as top 5 Head of Production producers in the 2018 B&W Report. Sam has taken his experience and insights to helping people identify their talents and unleash their true potential. Sam joined Mario on 10 Minute Mindset to talk about his belief that everyone is talented, the neuroscience behind focusing on our unique strengths, how to identify our talents, and his passion for helping others hone their unique gifts and use them to serve the world. Connect with Sam online at PBCoach.me and follow him on LinkedIn and Instagram. Chuck Bolena is back on 10 Minute Mindset to talk about overcoming adversity, the power of seeking out blessings in our life, and how to use our conscious and unconscious mind to intentionally attract thoughts that empower us to achieve the outcomes we desire. Chuck is a certified John Maxwell Development and Leadership Coach, Speaker, DISC Behavioral Analyst and an Amazon International Best Selling Author. Chuck holds a Master’s Degree in Counseling and Development with high honors and has a diverse, successful background in pharmaceutical sales, medical sales, mid-level management, and military leadership as an Air Force Officer. He is the President of Results from Thinking and works side-by-side with Jim Shorkey of the Jim Shorkey Family Auto Group. He has worked directly with Jim for the last four years; learning and mastering the very same success principles that allowed Jim to achieve his incredible success in the automobile industry. Chuck uses his skills, diverse background and training to enhance his passion for helping others overcome life's challenges and get the most out of life, both personally and professionally. Connect with Chuck online at ResultsFromThinking.com and follow him on Facebook, Twitter, and LinkedIn. Chuck Bolena is a certified John Maxwell Development and Leadership Coach, Speaker, DISC Behavioral Analyst and an Amazon International Best Selling Author. Chuck holds a Master’s Degree in Counseling and Development with high honors and has a diverse, successful background in pharmaceutical sales, medical sales, mid-level management, and military leadership as an Air Force Officer. He is the President of Results from Thinking and works side-by-side with Jim Shorkey of the Jim Shorkey Family Auto Group. He has worked directly with Jim for the last four years; learning and mastering the very same success principles that allowed Jim to achieve his incredible success in the automobile industry. Chuck uses his skills, diverse background and training to enhance his passion for helping others overcome life's challenges and get the most out of life, both personally and professionally. Chuck joined Mario on 10 Minute Mindset to talk about the power of daily disciplines, how focusing our intentions toward specific goals influences what we achieve, the importance of progress and how getting just a little better everyday compounds over time, and how our beliefs and identity ultimately attract our success. Connect with Chuck online at ResultsFromThinking.com and follow him on Facebook, Twitter, and LinkedIn. Tracey Maxfield is back on 10 Minute Mindset to talk about the live event she is organizing to help children understand the importance of help when it comes to mental illness, that symptoms of mental disorders are more common than we think, and the power of always believing that there is hope for a brighter future. Tracey is a nurse with over 35 years experience in the healthcare field in the UK, USA and Canada. She is certified in gerontology and dementia care and is a passionate dementia advocate and educator. Since the release of her book, Escaping the Rabbit Hole: my journey through depression, Tracey has become a staunch advocate for Mental Illness and Mental Health Awareness and Bullying and completed the course, Bringing Mental Health to Schools. She has met with teenagers ages 11 to 15 years to talk about bullying and mental illness and has appeared on numerous podcasts, live radio shows and ABC KOMO News 4, KSHV 45, and NBC News 6 television shows. In June, Tracey was featured in a series of articles by HelloCare magazine in Australia. In September, Tracey embarked on a new life journey, she sold her home, donated most of her possessions to various charities and made a commitment to try and make a difference in the world and is spending six months traveling in the USA, talking about mental illness and bullying in children and teenagers. Her philosophy is to Engage children and teenagers, to Educate them about mental illness and bullying and to Empower them to develop confidence and skills to continue to move ahead in their own life journey. Connect with Tracey online at TraceyMaxfield.com and follow her on Facebook, Instagram, LinkedIn, Pinterest, Twitter, and YouTube. Tracey Maxfield is a nurse with over 35 years experience in the healthcare field in the UK, USA and Canada. She is certified in gerontology and dementia care and is a passionate dementia advocate and educator. Since the release of her book, Escaping the Rabbit Hole: my journey through depression, Tracey has become a staunch advocate for Mental Illness and Mental Health Awareness and Bullying and completed the course, Bringing Mental Health to Schools. She has met with teenagers ages 11 to 15 years to talk about bullying and mental illness and has appeared on numerous podcasts, live radio shows and ABC KOMO News 4, KSHV 45, and NBC News 6 television shows. In June, Tracey was featured in a series of articles by HelloCare magazine in Australia. In September, Tracey embarked on a new life journey, she sold her home, donated most of her possessions to various charities and made a commitment to try and make a difference in the world and is spending six months traveling in the USA, talking about mental illness and bullying in children and teenagers. Her philosophy is to Engage children and teenagers, to Educate them about mental illness and bullying and to Empower them to develop confidence and skills to continue to move ahead in their own life journey. Tracey joined Mario on 10 Minute Mindset to talk about her passion for helping both children and adults battle mental illness, the childhood suicide epidemic and how we can combat it, and how reaching out for help when we feel we need it and refusing to give up the fight are two of the most powerful ways to show our true strength. Connect with Tracey online at TraceyMaxfield.com and follow her on Facebook, Instagram, LinkedIn, Pinterest, Twitter, and YouTube. Ronan Leonard is back on 10 Minute Mindset to talk about how to create what he calls a Return on Intellect, how to use this to create multiple streams of revenue as an entrepreneur, the difference between being a member of and facilitating a mastermind, and how to know when you’re ready to use a mastermind to bring your expertise to the world. Ronan teaches niche business owners and subject matter experts how to leverage their IP into additional revenue models and increase their industry profile all through the innovative concept of virtual Masterminds. Ronan loves seeing the benefits that Mastermind groups have on both the instructors and participants and has helped 100’s of business owners increase authority, revenue and expertise. Connect with Ronan online at Eccountability.io and follow him on LinkedIn, Twitter, and Medium. Ronan Leonard teaches niche business owners and subject matter experts how to leverage their IP into additional revenue models and increase their industry profile all through the innovative concept of virtual Masterminds. Ronan loves seeing the benefits that Mastermind groups have on both the instructors and participants and has helped 100’s of business owners increase authority, revenue and expertise. 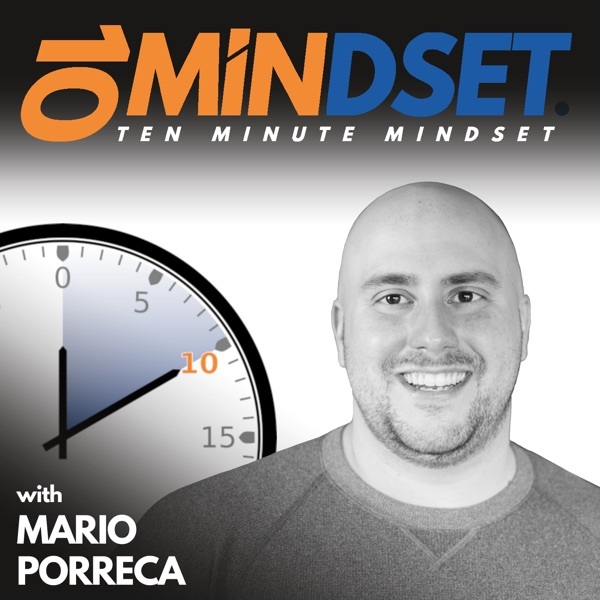 Ronan joined Mario on 10 Minute Mindset to talk about his passion for masterminds, the story of how he discovered his innate leadership ability and entrepreneurial spirit, some of the great things that come from being a part of a mastermind, and his platform that he developed to help others participate in and facilitate more effective masterminds. Connect with Ronan online at Eccountability.io and follow him on LinkedIn, Twitter, and Medium. Wilton Rogers III is back on 10 Minute Mindset to talk about the adversity he has overcome on his entrepreneurial journey, the mindset he had to develop to overcome that adversity, finding happiness in the simple things, and how consistency has been key to his success. Wilton is a business advisor, automation expert, and keynote speaker. Since the early age of seven, Wilton knew what he wanted to do. Seeing people light up, when he sold them eggs from his family farm, put a special feeling inside him. Seeing the appreciation of the service, that was shown to them, paved the path on Wilton’s entrepreneurial journey. At 19 he owned a production company doing weddings and commercials. In his 20’s he owned a dance club and cell phone company. He was in his 30’s is when he discovered his love of being a businessman. Like so many other business owners, Wilton had his share of failures. Failures that caused him to lose everything he owned and even at one point left him homeless. Then one special day he was introduced to a man that later became his mentor that helped him turn his life around fast. Over the last few years, Wilton has built relationships with highly respected and successful professional individuals. These relationships have formed business partnerships that led to him becoming part of an elite group of business leaders throughout the world. Connect with Wilton online at ScaleThroughAutomation.com and follow him on Facebook, Instagram, Twitter, LinkedIn, and YouTube. Wilton Rogers III is a business advisor, automation expert, and keynote speaker. Since the early age of seven, Wilton knew what he wanted to do. Seeing people light up, when he sold them eggs from his family farm, put a special feeling inside him. Seeing the appreciation of the service, that was shown to them, paved the path on Wilton’s entrepreneurial journey. At 19 he owned a production company doing weddings and commercials. In his 20’s he owned a dance club and cell phone company. He was in his 30’s is when he discovered his love of being a businessman. Like so many other business owners, Wilton had his share of failures. Failures that caused him to lose everything he owned and even at one point left him homeless. Then one special day he was introduced to a man that later became his mentor that helped him turn his life around fast. Over the last few years, Wilton has built relationships with highly respected and successful professional individuals. These relationships have formed business partnerships that led to him becoming part of an elite group of business leaders throughout the world. Wilton joined Mario on 10 Minute Mindset to talk about his entrepreneurial journey, the business he is currently building now, how he helps businesses scale and automate their processes, and some of the things he does to keep his mindset sharp day in and day out. Connect with Wilton online at ScaleThroughAutomation.com and follow him on Facebook, Instagram, Twitter, LinkedIn, and YouTube. Jacqueline Way is back on 10 Minute Mindset to talk more about creating happiness through giving, what happiness means to her, some of the simple gives that touched her the most, and her passion for changing the world one give at a time. Jacqueline has dedicated herself to social good projects both personally and professionally for over two decades raising over 10 million dollars for organizations globally, but it was Motherhood that inspired her to make a world of difference. In 2010 she made a commitment with her oldest son on his 3rd birthday to give back to the world every day for one year. They called it 365give. What started as a simple parenting project is now a global giving movement. Her TEDx Talk “How to Be Happy Every Day: It Will Change the World” has received worldwide attention connecting and inspiring people around the world to give every day. Jacqueline is now an inspirational Keynote Speaker and Executive Director of 365give working with a dedicated team of volunteers growing their vision to change the world 1 give, 1 day at a time. Connect with Jacqueline online at 365give.ca and follow her on Facebook, Twitter, YouTube, Instagram, and LinkedIn. Jacqueline Way has dedicated herself to social good projects both personally and professionally for over two decades raising over 10 million dollars for organizations globally, but it was Motherhood that inspired her to make a world of difference. In 2010 she made a commitment with her oldest son on his 3rd birthday to give back to the world every day for one year. They called it 365give. What started as a simple parenting project is now a global giving movement. Her TEDx Talk “How to Be Happy Every Day: It Will Change the World” has received worldwide attention connecting and inspiring people around the world to give every day. Jacqueline is now an inspirational Keynote Speaker and Executive Director of 365give working with a dedicated team of volunteers growing their vision to change the world 1 give, 1 day at a time. Jacqueline joined Mario on 10 Minute Mindset to talk about the organization she started with her son Nick called 365give, #Do1GiveDay on April 17th, her family’s passion for giving, and how giving is actually scientifically proven to create happiness within us. Connect with Jacqueline online at 365give.ca and follow her on Facebook, Twitter, YouTube, Instagram, and LinkedIn. Adrian Shepherd is back on 10 Minute MIndset to explain his Pyramid of Productivity. He also shares some specific tips or hacks to help us become more productive throughout the day and tells a story from his college days that opened his eyes to the power of all-out focused effort over a specific period of time. Adrian started his career as an ESL teacher in Japan, but today focuses on consulting with individuals and companies on productivity. His background in education helped him develop The One-Bite Time Management System (TMS), a revolutionary new system based entirely around simplicity: small bites that people can digest easily. Adrian Shepherd is based in Osaka, Japan. Connect with Adrian online at AdrianShepherd.com and follow him on Facebook and LinkedIn. Adrian Shepherd started his career as an ESL teacher in Japan, but today focuses on consulting with individuals and companies on productivity. His background in education helped him develop The One-Bite Time Management System (TMS), a revolutionary new system based entirely around simplicity: small bites that people can digest easily. Adrian Shepherd is based in Osaka, Japan. Adrian joined Mario to talk about how he defines “time”, what productivity and time management mean to him, and how being proactive and using the actual time we have more effectively increases the quality of our work and our lives. Connect with Adrian online at AdrianShepherd.com and follow him on Facebook and LinkedIn.